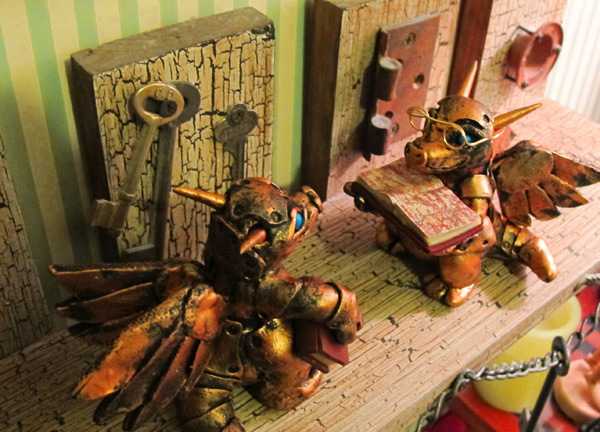 A pair of polymer clay steampunk dragons. These were made to be wedding cake toppers. 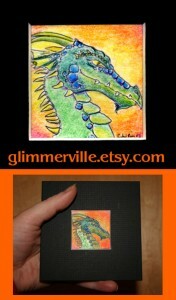 But I think librarians may like a little help like this too. Frankly I am sure I have a ton of addictions, but I am only considering one in this post: I love to buy books. And, since I only have so much shelf space, I concentrate on buying books I can’t just go get in the library. Consequently, I don’t have that many novels (though I have my favorites). Instead I concentrate on How-to books and Field Guides. Right now I have just noticed (thanks to Amazon suggesting it) “Yet Another Art Instruction book I Cannot Possibly Live Without”. 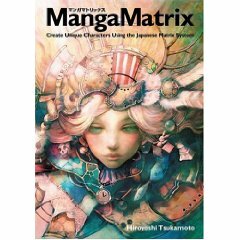 The book is called Manga Matrix: Create Unique Characters Using the Japanese Matrix System by Hiroyoshi Tsukamoto. Now anyone familiar with the stuff I doodle will say “But Rachel, you don’t even draw Manga style anything” and this is true. But I find the style (frequently) very pretty – especially when I think of Ghibli or sometimes Clamp, etc. I have several books on the style just to reference anyway. But my real question, which should probably be posed over at http://Conceptart.org is this: When do you say to yourself “Intervention! Buying one more art instruction guide is not going to help you improve; actually drawing is the only thing that will actually help you improve”? That’s one of those questions I don’t like! Monday I had Jury Duty. 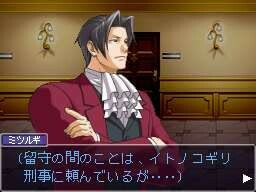 Of course, in my head when the judge came out I called him “Udgey” and when the prosecution came out I called him “Edgeworth” and the defense was “Phoenix” – and, strangely, it was a little bit like that. No the defense and prosecution and judges weren’t like that, really – the jury was! The defense and prosecution started out by asking questions of the jury, to see if anyone was unfit to stay (due to some kind of bias), and it was amazing the weird stuff that came out of the woodwork. They disqualified one person, and the replacement was the granddaughter of the previous judge in the court. (And she looked like someone that could be in an Ace Attorney game, too – she was about 19 and had loads of blond ringlets and was continuously chewing gum.) Another jury member turned out to be the neighbor and friend of the prosecuting attorney. They asked if anyone had ever had a crime committed against them and fully half of the jury raised their hands to say they had had their homes/cars broken into. And this is a small rural village, not some kind of grimy downtown depressed area! I had no idea it was so hard to pick a jury, even in a little case like this. Anyway they didn’t pick me to stay on the jury, so I actually got some other things accomplished like sending a package to Philippa Ballantine (go read her books/listen to her podcast novel) and getting my snow tires put on. I helped babysit a 5 year old for about an hour, too. I went to get out all my old action figures so he’d have something to play with and I had 2 Darth Vaders, 2 Darth Sideous, and 1 Darth Maul Uhh… well everyone knows bad guys are coolest anyway. Also, the description of this Tome of Levity game supplement book cracks me up. Any game mechanic that lets you eat the fruit out of still life paintings is awesome. And one more parting link: A poem by G. K. Chesterton, that was quoted in part on The Sonic Society.